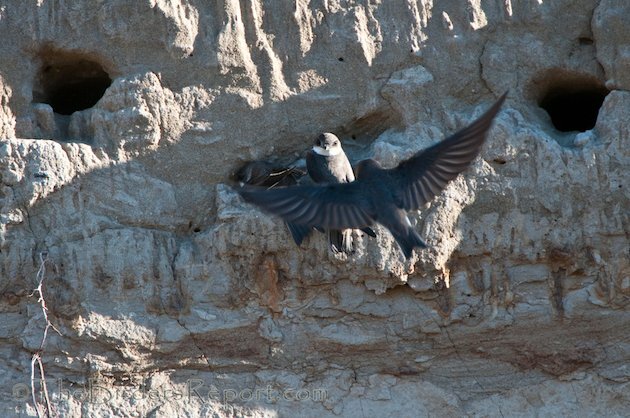 The Bank Swallow (Riparia riparia) is North America’s smallest swallow. 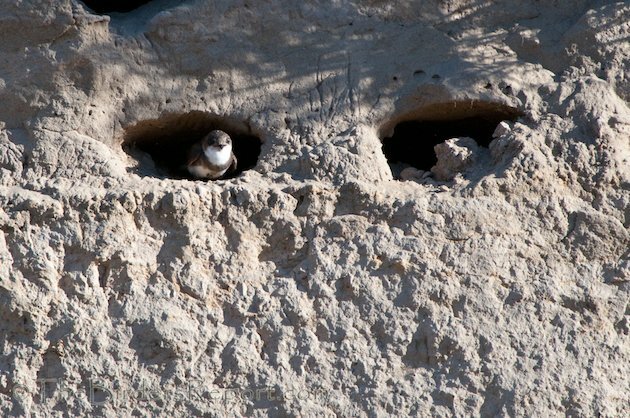 It can be distinguish from the Northern Rough-winged Swallow by its dark breast band and the white of the throat curling up behind its ear. Click on photos for full sized images. 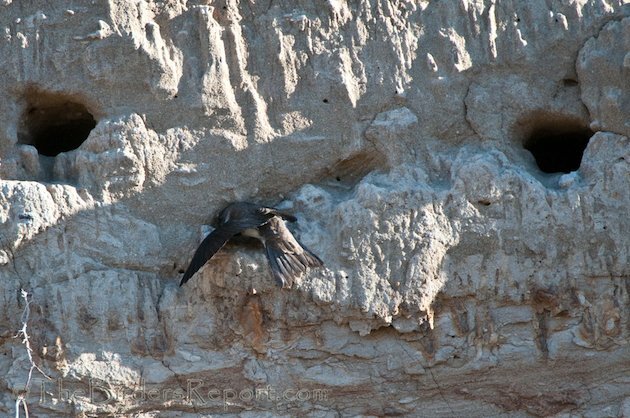 The recently released 2014 State of the Birds Report lists the Bank Swallow as one of the common birds in steep decline. The report identifies 33 species that do not meet the Watch List criteria but are declining rapidly in many areas. 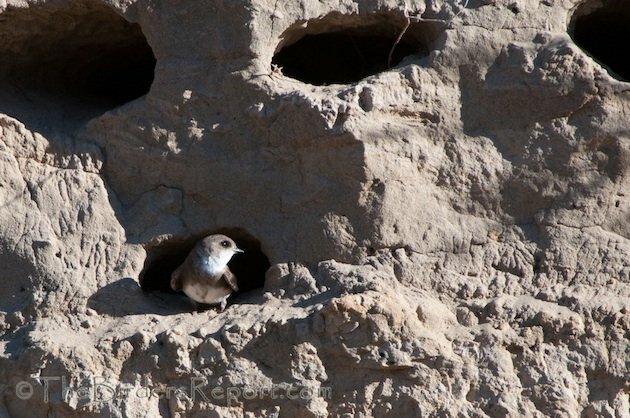 These birds have lost more than half their global population, and the 33 species combined have lost hundreds of millions of breeding individuals in just the past 40 years. 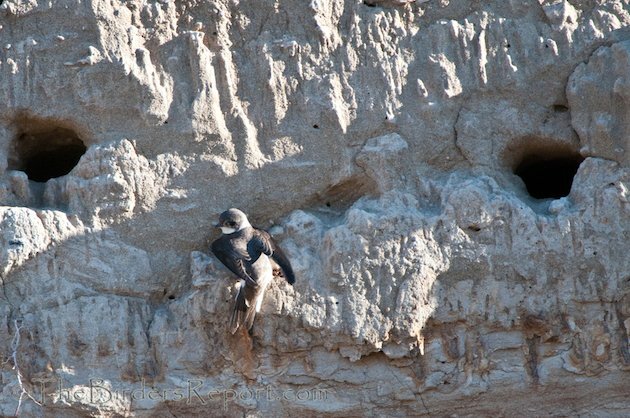 The Bank Swallow was listed as a threatened species in California in 1989 by the California Fish and Game Commission and the number of breeding pairs has declined steadily since then. The main reason for this rapid decline, as in the case of most species, is loss of habitat. 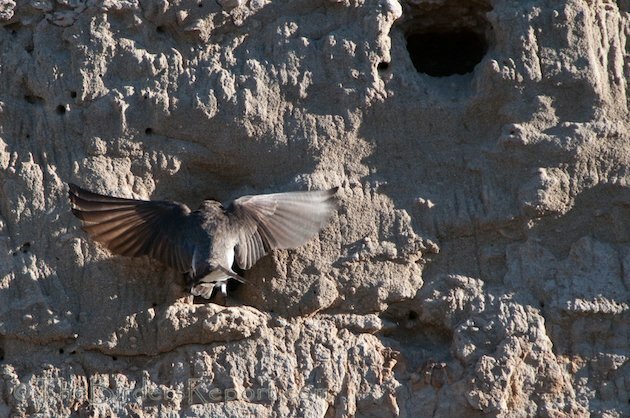 In California, much of the Bank Swallow’s nesting habitat in the southern and central areas has been eliminated by flood and erosion-control projects. These projects destroy or alter nesting habitat when banks are sloped to 45° and large rocks (riprap) are placed on the slope. 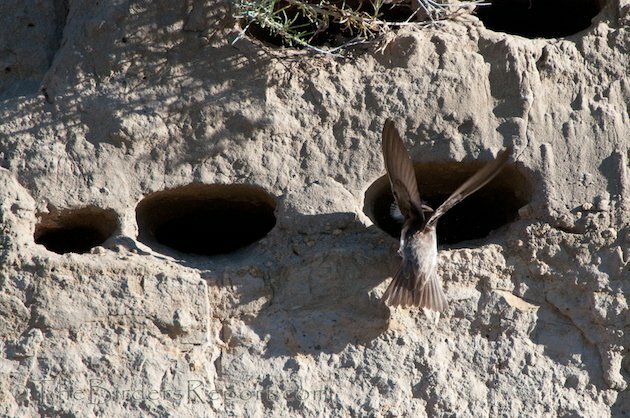 Historically, all Bank Swallow colonies in North America were found in natural sites such as banks along rivers, streams, lakes, and coasts; today, many colonies are in human-made sites like sand and gravel pits and road cuts. This colony in Fall River Mills, about an hours drive from my home, is just down river from Fall River Lake and is located on a busy highway. 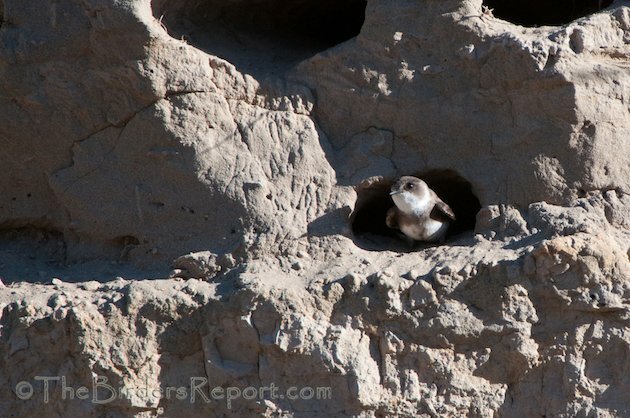 The two photos above the video and these few that follow are a series I took of one of the birds beginning to dig a burrow. 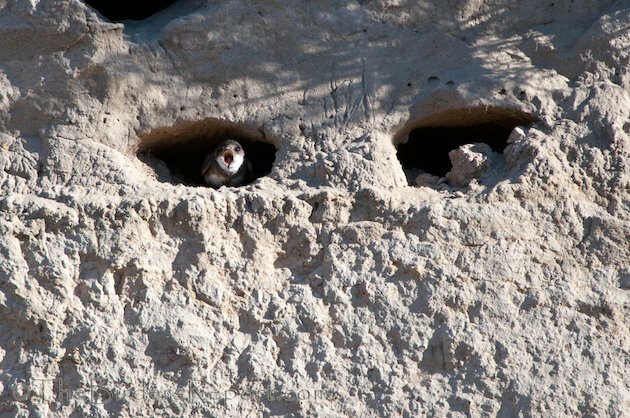 The bird on the left of the photo is doing the digging. You can see some of the scrape marks in the middle of the frame. 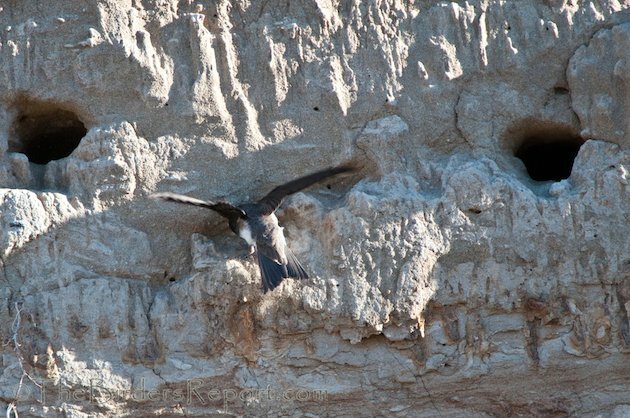 Burrows are dug with the bill, feet, and wings as birds cling to a slight projection on the bank face, and dig using their bill in a rapid, slashing motion and feet in a scratching motion. 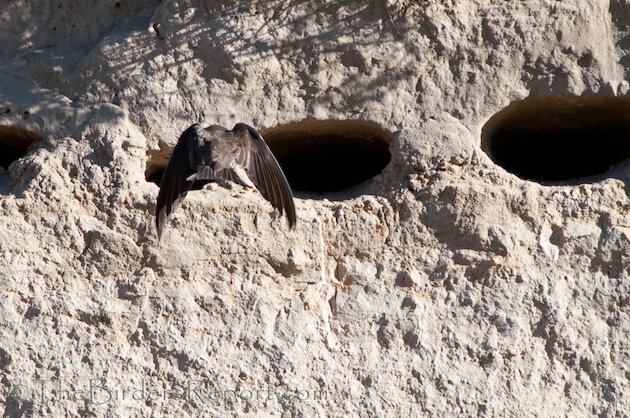 Dislodged material from inside the burrow is ejected with vigorous kicks and wriggling body and wing shuffling movements1. You will be able to see some of this digging behavior at the beginning of this video. 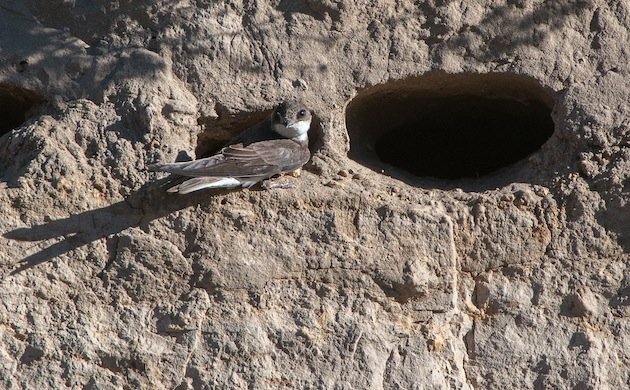 While excavating burrows you will also see unpaired males performing their “territory circle-flights,” where they fly and sing in small circles around the burrow entrance advertising to unpaired females. 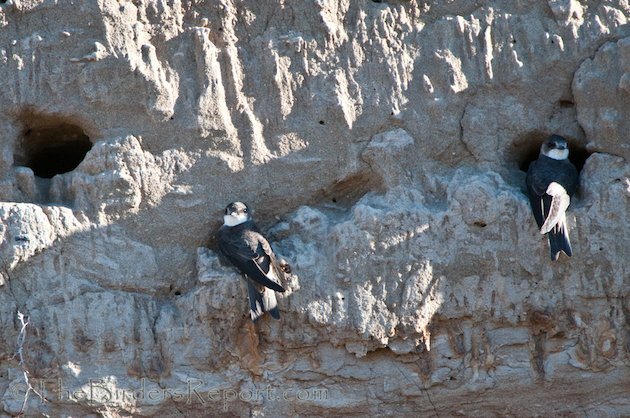 The male perches on the burrow ledge displaying his white throat-patch if a female lands near the burrow after his display1. 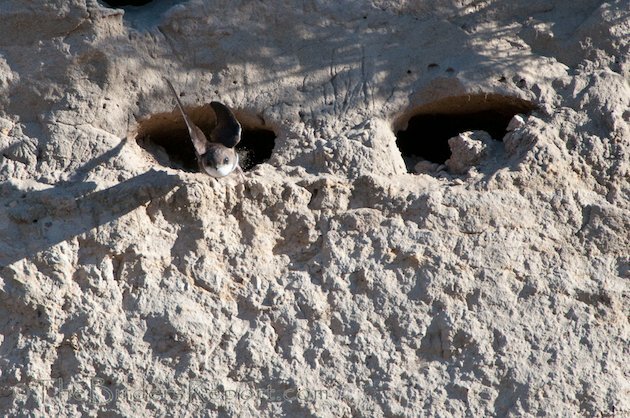 Once the burrow is excavated, the male performs “invitation flights” as he overtakes flying females and lands at the burrow to entice the female inside. Some of the birds must have already paired up. 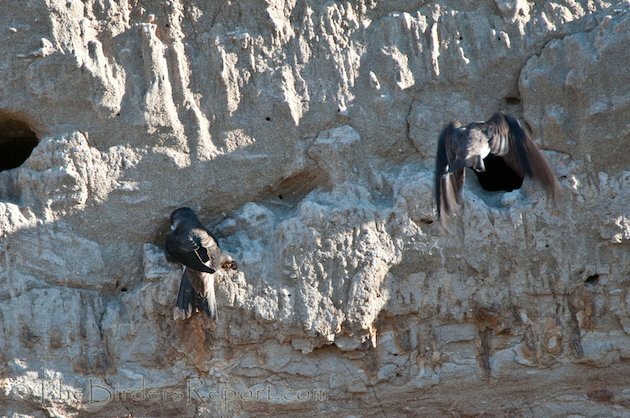 As you may have noticed in the video above, some were seen bringing nesting material into the nest burrows. 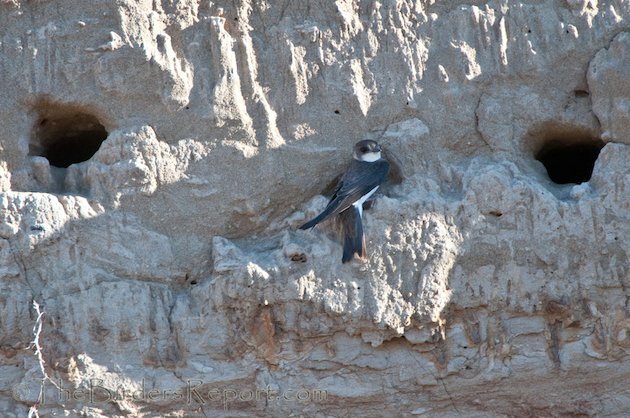 If you look closely, just to the left of this swallow’s wing, you can see it is carrying a feather in its beak. 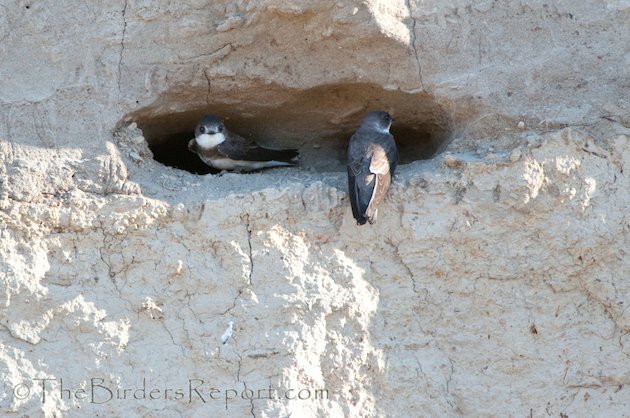 Observing these different behaviors I believe these Bank Swallows were in different stages of the nesting process. 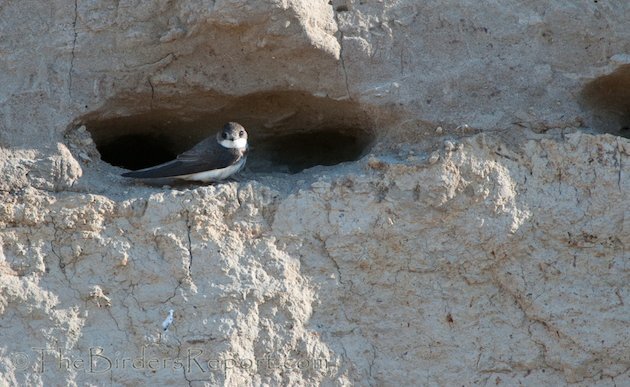 Since there is no sexual dimorphism between the male and female Bank Swallow you really can’t tell them apart until they begin incubating eggs, at which point the female will have a brood patch and the male will not. But it’s fun trying to figure it out by observing their behavior. Whether you’re looking at a male or female, they certainly are cute.